At a recent animation festival in a small coastal town in the U.K., I posed a question to members of a panel that included figures from EA, Sony and DreamWorks Pictures. It was simple, direct and, in my mind at least, a question that desperately needed an answer. It was prefaced with a statement that suggested the games industry doesn't feel like it is being supplied with talented young designers, and that educators like me are locked out of the often closed world of gaming. 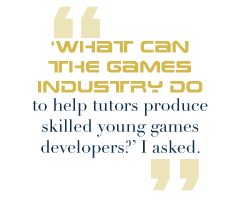 "What can the games industry do to help tutors produce skilled young games developers, and what can we do to build bridges with you?" I asked. After traveling six hours - a world away from where I teach and work - to get a response, their lack of a clear answer was surprising. The host of the day talked about events like the one we were attending. The reps from Sony and EA looked at each other. They all mentioned basic arts skills - yep, we teach that. "Understand the industry better," they suggested. Our curriculum does that, too. Then, before the long silence got even longer, they sought out other questions. Although the panel's responses were revealing, the most important thing about that day wasn't the professionals delivering the keynote speeches: it was the 60 or so teenagers who made the journey to try and find out more about the games industry. Their peers in the U.S. are 11th grade juniors and 12th grade seniors. Every one of them was a fan of games, every one of them a gamer and every one of them a games development student from the Josiah Mason Campus of Sutton Coldfield College, an inner-city school in the middle of England. They are pioneers too, because until very recently, any young adults that wanted to study videogames had to wait until they reached university to do so. Undergraduates across the U.K. are offered a bewildering array of games-related courses, from Games Technology to Digital Art for Computer Games. At last count, there are over 300 degree-level courses that pertain to games design. Yet young people who were passionate about the subject found themselves waiting around and taking other courses until they made it to university. Then, in 2007, a change took place. Edexcel, an awarding body and exam board here in the U.K., quietly introduced a media course focusing on games, which colleges teaching the equivalent of high school students could provide. Most colleges ignored the new offering, deterred by the cost of setting up a new qualification and the risk of not actually attracting any students after investing all that time and money. Fortunately for the students at the festival, their college was among those that took advantage of the opportunity.